Since 2005, we have offered specifically designed, cloud based eProcurement and eMarketplace solutions to our clients. Our programs offer complete, intuitive, scalable eProcurement solutions, supporting and maximizing, the buyer-supplier-reseller relationship. 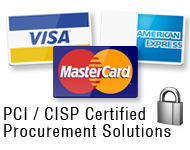 Buyers receive PCI compliant, CISP certified card payment processing platform, benefiting all parties. Our solution adheres to strict industry standards for storage, transmission and security of credit card data. We process transactions on behalf of both buyers and suppliers, preventing fraud and reducing risk. Suppliers access, ePS Fulfill. This solution provides suppliers the ability to capture a PO from any size eMarketplace environment, send back an electronic invoice in a standardized format and receive full reporting services. Resellers receive our difference maker, the ePS eMarketplace Platform. Our Partners now have the ability to bring an eMarketplace to their customers, capture a PO from any eMarketplace environment, send back an electronic invoice and receive full reporting services. Through our unique solutions, Resellers are the "supplier of record"
Our cloud based software solutions are the best, but that's just the start. Our people, our customer service and our continuous innovation deliver results.. We welcome you to explore our solutions further, or contact us to schedule a demo, and let us personally take you through all we have to offer. Thank you for this opportunity to support your success. Here at ePS we are built to maximize the Buyer-Supplier-Reseller relationship. We accomplish this by delivering fully developed, proprietary solutions that undergo continuous improvement, supported by the best team in the industry. We believe in open communications. We enable a culture that encourages creativity and innovation, and fosters adaptability. We make sure our software is the best; so are our people and our customer service. We are fully committed to the success of each and every customer. For over fifteen years ePS has been a leading provider of eMarketplace solutions specifically designed to provide spend visibility and control. Our cloud-based suite includes: Procurement Software, Spend Analysis, Supplier Automation, Sourcing, Contract Compliance, and Accounts Payable Automation. We specialize in connecting any Buyer with any Supplier. Our web-based solutions are affordable, simple and powerful, providing distinct features that set us apart from anyone else in the eMarketplace, eBusiness and Supply Chain markets.